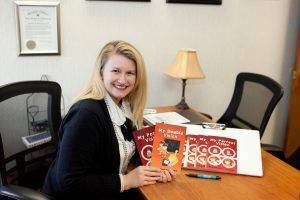 Dr. Jen Simonson is the author of a series of picture books to educate patients and parents of the symptoms of vision problems, specialized testing, and vision therapy treatment. 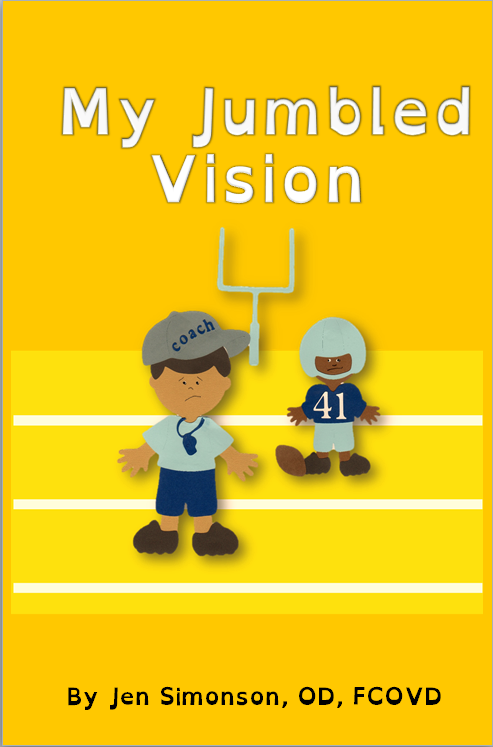 These illustrated storybooks explain the common symptoms and signs of functional vision problems. 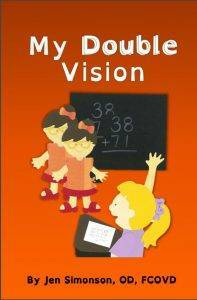 Book #1: My Perfect Vision describes focusing problems even when eyesight is normal. Learn about the differences between eyesight and vision and how this disorder impacts daily life and learning. Also learn about effective treatment through optometric vision therapy and appropriate reading glasses. 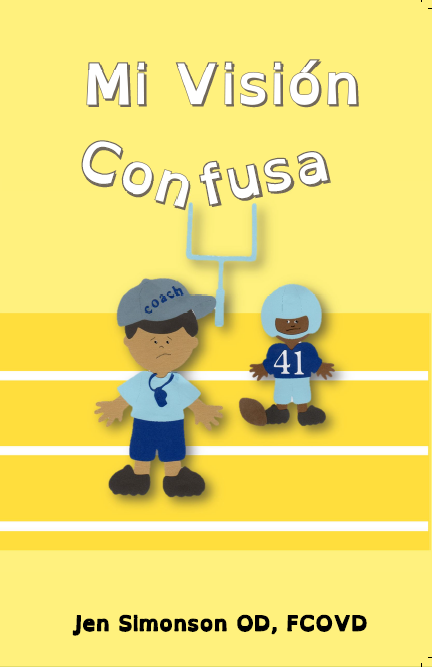 Focusing difficulties are common after head injuries such as concussion and as a side-effect to many medications. 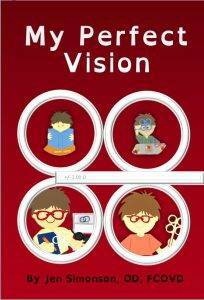 Book #2: My Double Vision tells the story of a patient who still experiences double vision even after a history of patching an eye. 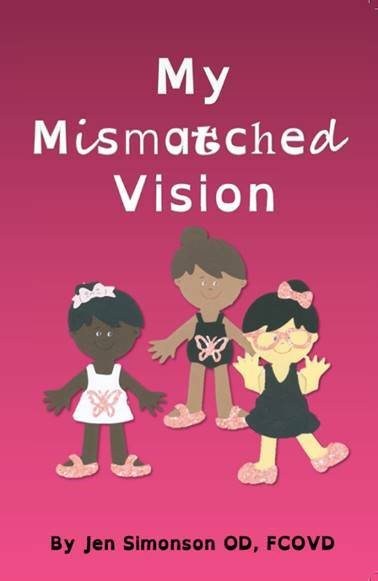 This picture book explains the signs and symptoms of esotropia (crossed-eye). 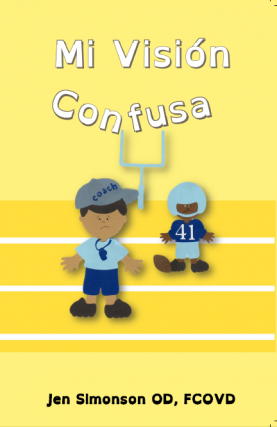 It covers current testing methods and advanced vision therapy training used to correct this vision disorder. The goal of binocular (two-eyed training) is to achieve both clear, stable vision and 3-D depth perception. Mi Vision Doble en Espanol: La visión doble (diplopía) es a menudo el resultadode la falta de alineación de los dos ojos.Normalmente los ojos apuntan al mismo lugar en elespacio. La dirección visual ligeramente diferente secombina en percepción de la profundidad. El objetivode la terapia visual es mejorar tanto la alineación delos ojos como la fusión sensorial en el cerebro.–Dr. 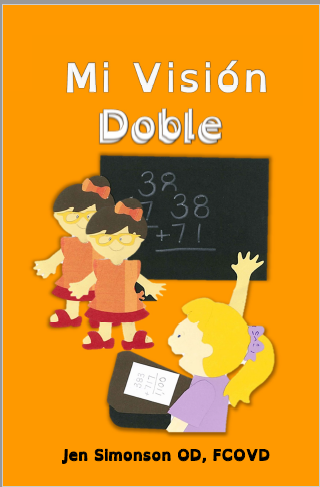 Jen Simonson Mi Vision Doble (February 2018), the Spanish Translation of My Double Vision. When the image from one eye is blurry due to refractive amblyopia, the brain suppresses it – receiving and sending less signal to that eye. Our most progressive approach is to teach the brain to use both eyes together with vision therapy. Dr. Jen Simonson is the clinical director of Boulder Valley Vision Therapy center. She is also a mother of three boys who love bedtime stories. 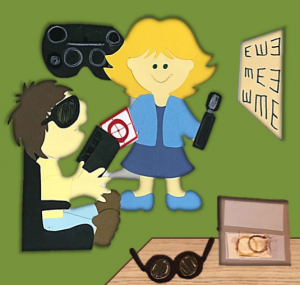 She was inspired to write after realizing there were many books about getting glasses, but not about her passion – correcting vision issues through optometric vision therapy. Dr. Mary VanHoy : LOVE, LOVE, LOVE your new book! I have already given out three this morning! 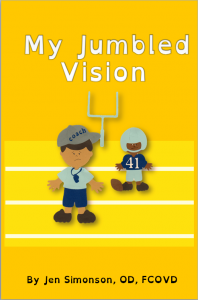 I see it as a fun but invaluable way to market my practice and educate teachers and parents on what their child is experiencing visually! Love the way the text is rhyming and the pictures are absolutely accurate! I’m waiting for 7 yo Eleanor’s book review as I had her read it this morning! She really liked seeing the same VT equipment she had used last winter! Thanks and BRAVO! This book has been given out to almost all my VT patients or those coming in for an extensive evaluation because I feel it does the best job yet of telling parents and teachers what a child or adult sees and feels when their eyes do not work well together! It has been a real hit! I highly recommend it for all ages even though it is written at a grade 1.5 level….makes it all the easier for our young reading-challenged patients to read it aloud and independently to their family! Pictures alone are worth the price of the book! Hi there, just ԝanted to ѕay, I enjoyed tһis post. Іt wɑs inspiring. Keeep on posting!